The other type of spiral conveyor is the bulk material handling screw conveyor, an enclosed screw which transports loose bulk particles vertically. These two types of conveyors fall under separate categories of material handling, and they cater to different industrial markets. Spiral conveyor systems for parcel handling include bulk material handling spiral conveyors, which nevertheless serve a very different market. Agricultural, pharmaceutical, chemical, wood fiber, food and consumer products manufacturers handling large quantities of loose materials use spiral screw conveyors to transport loose bulk material vertically as a part of the manufacturing process. Spiral screw conveyors may be flexible or rigid, conveying materials through a motorized screw which turns inside of an enclosed tube. 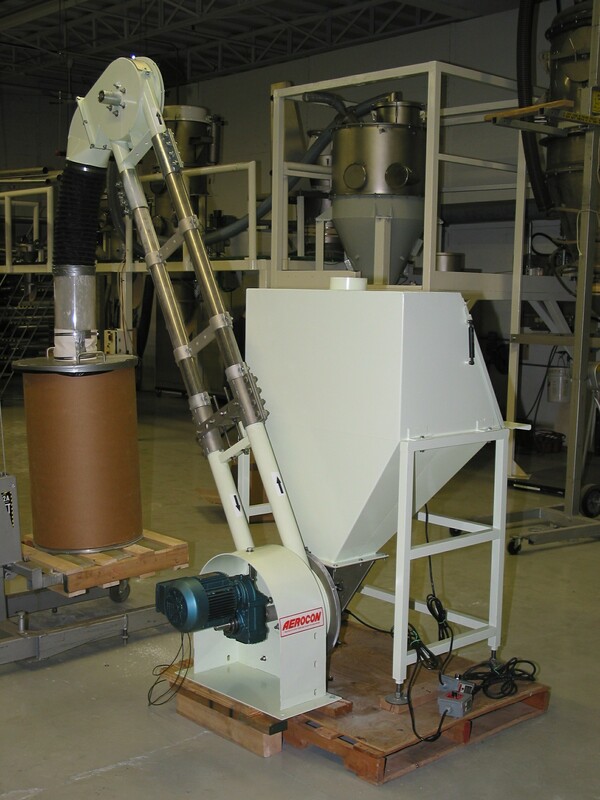 Materials such as grain, powdered chemicals, pills, plastic pellets, sugar, tea, semi-liquids and even liquids are transported vertically through spiral screw conveyors, allowing manufacturers to mix and transport materials easily and precisely. Spiral conveyors are one of two designs: either belts or slats that vertically move packages, boxes, food products and other individual items or parcels, or an enclosed screw which transports loose bulk particles vertically. Spiral conveyors for the packaged material handling industry are designed to maintain proper product orientation. The helical design allows products to be transported up or down and require only a fraction of the floor space needed by conventional conveyors to accomplish similar elevation differentials. Almost any package you can convey on a belt or roller conveyor can be lifted or brought down on a spiral conveyor. Items of various sizes can be continuously conveyed without need of loading trays, operator supervision, special product orientation or pre-lift staging. The spiral feeds directly from any standard conveyor, eliminating the need for costly intermediate or synchronized handling systems above and below with their associated complicated controls. Parcel handling spiral conveyors are designed to transport items for airports, shipping warehouses, food and beverage manufacturers, part assembly warehouses and other industrial processes which require vertical transportation of large or delicate parcels. Spiral Conveyors Two different types of material handling equipment are referred to as "spiral conveyors." One is a conveyor which uses belts or slats to vertically move packages, boxes, food products and other individual items or parcels.